Agni Inc, the authorised dealer of Mahindra vehicles in Nepal has launched E-Verito sedan car from Mahindra Automobiles India. Mahindra e-Verito is an electric version of Verito sedan that derives power from the latest drivetrain technology from Mahindra Electric. The all-electric, zero-emission sedan. Powered by 3-phase 72V induction motor producing 30.5 kW of power and 91 Nm of torque, the sedan gets the direct drive single speed transmission channelizing power to front wheels. The 200Ah Li-ion battery is used to power music system, headlamps and AC. The electric sedan can be charged at home through fast charging technology and takes around one hour and 45 minutes for one full charge. On one full charge, the sedan is claimed to travel up to 110 kms. A 72V 3-Phase AC Induction Motor making 30.5 kW at 3500 rpm and 91 Nm torque at 3000 rpm powers the electric sedan. Drive is transmitted to front wheels through a direct drive single speed transmission is mated to the motor.The car can run up to 110 kms on one full charge that takes around 45 minutes. 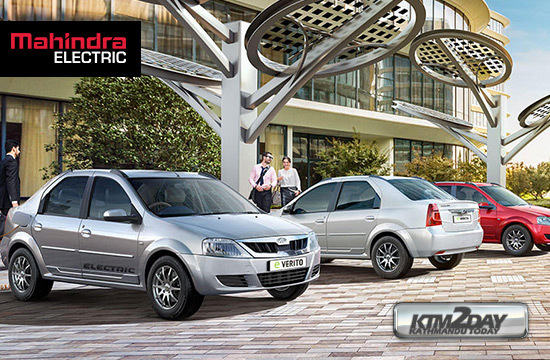 The company claims to provide a 3 year warranty on the battery and the price of this vehicle is set at Rs.28,80,000.